When a loved one reaches the end stages of life, many families seek hospice care. Hospice care helps to reduce a person’s pain and manage his or her discomfort, promoting the best quality of life possible in those final days. There’s no universal hospice care definition, but it’s often covered at least partially by Medicare and can be provided in the patient’s home or within a care facility. Medicare-reimbursed hospice care requires a person has a prognosis of six months or less, whether that’s related to terminal cancer, congestive heart failure, or another condition. Do I Need Supplemental Hospice Care Support? Sometimes, families may not qualify for hospice care via Medicare, or what they do qualify for may not cover all their needs. In these instances, family members can wind up feeling like they have to act as caregivers when what they’d like to do is focus on spending quality time with their loved one in his or her final days. The good news is that there’s additional care beyond traditional hospice care. A BrightStar Care agency in your community can provide that additional care. If you don’t qualify for Medicare-reimbursed hospice care or simply need more than what your hospice nurse can offer, our professional caregivers can help in a number of ways. Nurses and, when allowed by state regulation, specially trained caregivers can provide in-home medication management, whether that’s supervision or actual administration. With their close, compassionate attention, they can make sure your parent is as comfortable as possible by gently repositioning him or her in bed or attending to dry mouth. They can also assist with things you may be overwhelmed by, such as bathing your parent and helping him or her to use the bathroom-they can even attend to household tasks. This allows you to make the most of the remaining time you have with your loved one. We often hear our clients say that our services have enabled them to be a daughter or son again. BrightStar Care’s compassionate approach and clinical training provide much-needed practical and emotional support to families in hospice care. Discover how we can help: Compassionate, Person-Centered Approach At BrightStar Care, we treat each client as a person, not a condition. In our hiring process, we screen candidates for compassion and have built a team of empathetic caregivers who are passionate about what they do. We match our caregivers to clients based on personality and preferences. Over time, our caregivers get to know clients and build deep, lasting relationships-some clients even say their caregiver is like a member of the family. This personal connection is especially precious as a parent faces the end of his or her life. Nurse Supervision on all Client Care Plans To provide the best possible care, BrightStar Care requires supervision by a Registered Nurse (RN) on all client care plans. In an initial visit, one of our nurses will conduct a comprehensive health and wellness evaluation and risk assessment in your home. An RN will continue to visit on an ongoing basis to ensure your loved one is as comfortable as possible in his or her last days and supervise the caregivers providing end of life care. Accreditation from The Joint Commission Accreditation by The Joint Commission, an independent, non-profit organization, is seen nationwide as a symbol of quality healthcare. BrightStar Care is proud to hold all its franchisees to this standard, which entails a rigorous on-site review by Joint Commission surveyors for patient safety and quality. As a result, we’ve earned The Joint Commission’s prestigious Enterprise Champion for Quality Award five years in a row. 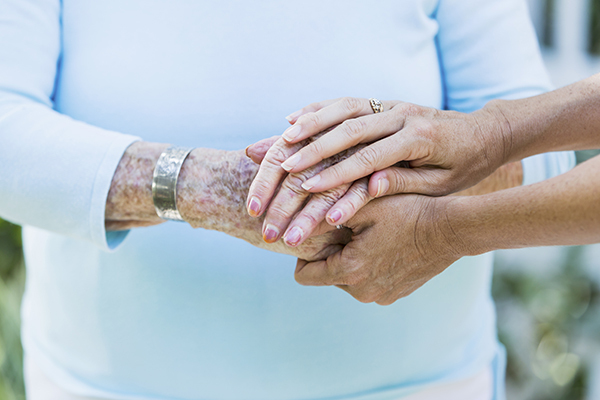 Related reading: What Should Caregivers Know About Palliative Care? You want to ensure that the end of your loved one’s life journey passes with as much comfort and dignity as possible. At the same time, you may have financial constraints to consider. In-home care, including supplemental hospice care, are typically paid for privately, by the client. BrightStar Care can help you assess your needs, both in terms of level of care and finances, to find the best fit. Give your parent the gift of compassionate care. Consider your parent’s vulnerability and how invaluable his or her dignity and comfort are, especially when time is limited. Don’t forget this may include asking a priest, rabbi, or other spiritual figure to visit if your parent wishes it. Spend time with your parent. Simple things can maximize your parent’s quality of life in the precious time that’s left. Share memories, read stories, play special music, or just sit by his or her side. Take care of yourself. Remember that you need and deserve support, too. Take time for yourself, whether that’s to run a simple errand, enjoy a walk, or attend a support group. Call BrightStar Care today at 866-618-7827 to learn more about our private home care and find a location near you. You can also contact us online.